That's Nifty: Good morning to all !! Hello I hope everyone is well. 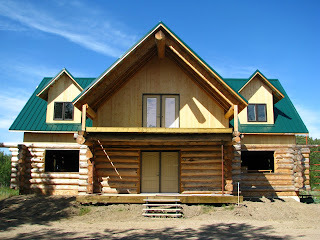 I thought I would post some of the most up to date photos of the progress on our new log home, also new development that you wont see in the photos, include roughed in power, water and sewer line' s into the basement, as well as the heating line for our wood boiler that sits outside. Fantastic house Jamie, can't wait to see it, when its finished!! I'll be checking in regularly to your blog, to see how its going - Keep up the great work, I enjoy seeing your creations.. Lisa (lil sis). Wow, very nice! My parents had a log home, now it belongs to my brother! It is always a source of amazement to all our friends when they visit!